Use a lightly damp mop to clean your laminate floor. The following maintenance and prevention steps are recommended to keep your laminate floor looking new. 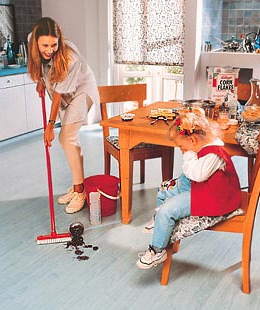 Vacuum (with the beater bar off) or sweep, use a dust mop or wipe with a damp cloth. Wipe spills with a cloth or sponge. Place a natural or colorfast mat at outside entrances to collect tracked-in dirt and to absorb excess moisture. Use a well-squeezed damp mop with a No-Wax floor cleaner only. A light damp mop is all you need. For added resistance to denting, use felt floor protectors on chairs and other furniture. As a general rule, the heavier the item, the wider the floor protector should be. Remove tough spots like shoe polish, tar and asphalt driveway sealer with nail polish remover containing acetone. Then wipe with a damp cloth. Do not use soap-based detergents or “mop and shine” products, as these can leave a dull film on your floor. Do not use abrasive cleaners, mechanical buffers, steel wool or scouring powder on the floor, as they will scratch your floor. Do not wax or polish your floor because it already contains a protective layer.